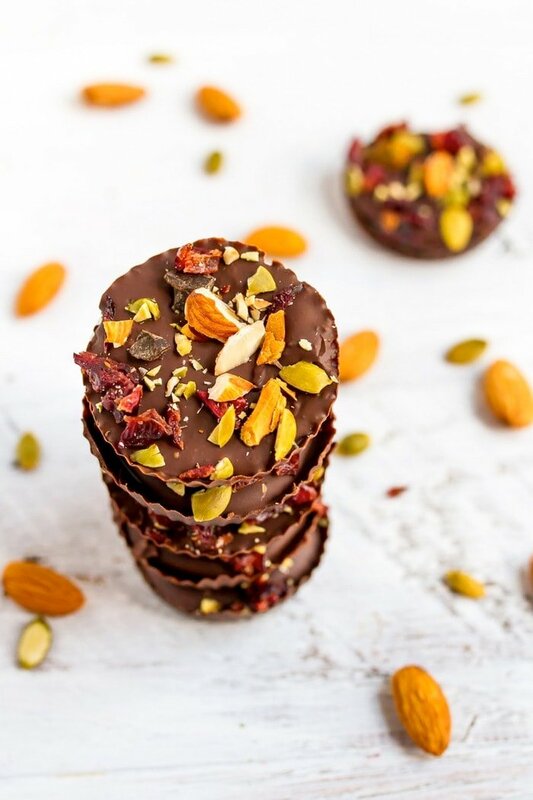 Easy 4-ingredient trail mix coconut butter cups that are vegan, gluten-free and paleo-friendly. My love for trail mix runs deep. 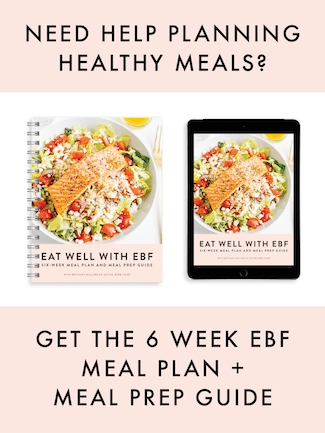 It’s been one of my fav snacks for ages and it’s the main reason I named my site “Eating Bird Food.” Hence the reason I have a ton of healthy trail mix recipes here on EBF. And if you’ve been following me on Instagram you’ll know that lately I’ve been having a moment with coconut butter. I posted my coconut butter recipe a few weeks ago, but have since realized that making coconut butter in my Vitamix is crazy fast and easy. Coconut butter in the food processor takes about 11-15 minutes, but it literally takes 1-2 minutes in the Vitamix and it comes out super smooth and drippy. It’s amazing. The secret is making sure your quantity of unsweetened coconut fills up the container so it doesn’t get stuck under the blades. I’ve found that one bag of the Trader Joe’s unsweetened coconut flakes (which is about 3-4 cups) is perfect. 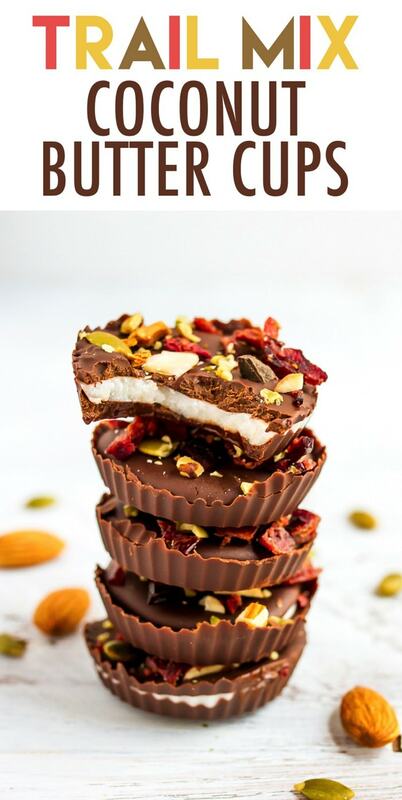 Now that I’ve figured out this quick method for making drippy coconut butter, I’ve been making it just about every week and using it so many ways — as a snack (straight up with a spoon), as a spread, in smoothies and making a few special treats like these trail mix coconut butter cups. 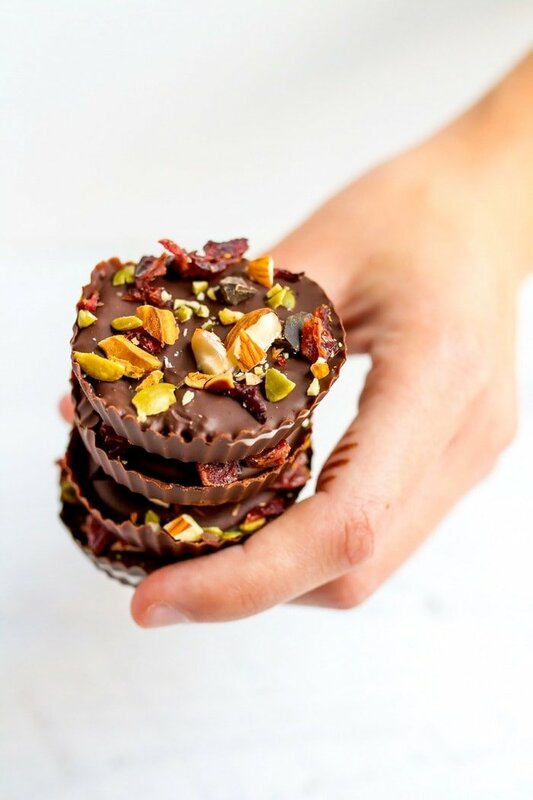 An old favorite (trail mix) and a new favorite (coconut butter) come together for one easy and delicious treat — oh yeah!! 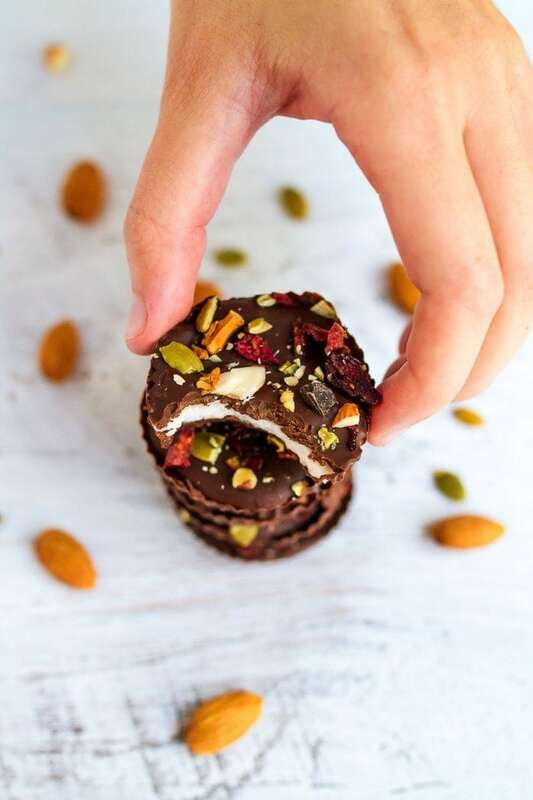 Coconut butter is a healthy fat that’s loaded with health benefits, but the main reason I love these coconut butter cups is because they’re so rich and satisfying. You can have one after dinner and feel content, which isn’t always the case with some sweets and treats! Just like my homemade peanut butter cups, they’re super easy to make! I used homemade coconut butter, but you can find coconut butter at most health stores or buy it online too. As for the trail mix topping I used one of my favorite blends from Trader Joe’s, but you can use whatever dried fruit and nut mix you love. Also feel free to play around with the toppings. I’ve done toasted coconut as a crunchy topping, as well as, pink Himalayan sea salt. Both were awesome. 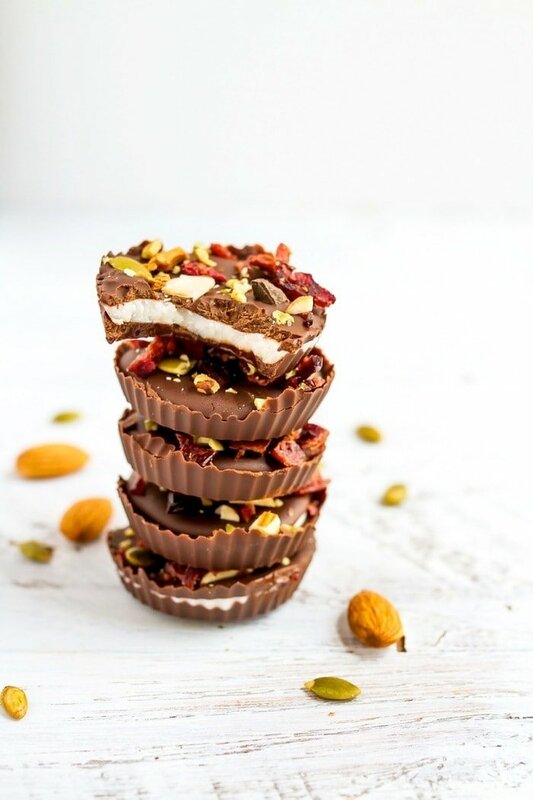 Super easy coconut butter chocolate cups with a crunchy trail mix topping! They’re vegan, gluten-free and paleo-friendly. Line a muffin tin with six cupcake liners. Silicone liners work great! In a microwave-safe bowl, melt 1/3 cup chocolate chips with 1/2 teaspoon coconut oil in the microwave at 15-20 second intervals, stirring between each interval. It should take less than one minute for the chocolate to be completely melted. Using a spoon drop enough chocolate (about 1-2 teaspoons) to cover the bottom and sides of each cupcake liner. Use all of the melted chocolate, but keep the bowl handy. You’ll likely need to use a utensil to spread the chocolate up the sides. Place tray into the freezer for about 5 minutes for the chocolate to setup. Remove from freezer and spoon 1 teaspoon of coconut butter into each chocolate cup. Spread to cover the bottom of the cup and place tray back in the freezer for about 5 minutes. 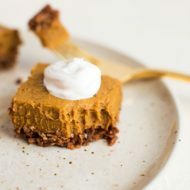 While the coconut butter sets up, add the remaining 2 Tablespoons chocolate chips and 1/4 teaspoon of coconut oil to the chocolate melting bowl and heat in the microwave for 15-20 seconds to melt. Stir. Remove tin from freezer and spoon chocolate over each coconut butter cup , using just enough to completely cover all the coconut butter. Sprinkle 1 teaspoon trail mix on each cup. Place tin into the fridge for about 30 minutes to set completely. Once set enjoy or store in a covered container in the fridge. Remove from fridge about 5-10 minutes before serving otherwise the coconut butter will be too hard to bite through. 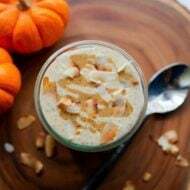 *Coconut butter is solid (like coconut oil) at room temp so if it’s not freshly made or you don’t live in a warm climate you may need to melt it for measuring. **I made these with Enjoy Life vegan, dairy-free chocolate chips so they still have about 9 grams of sugar per cup. If you want to make version with less sugar, you can try using different chocolate chips (like these sweetened with stevia) or can experimenting with making your own chocolate coating with coconut oil and cocoa power like I did for my Chocolate PB Eggs. If you try this recipe, be sure to let me know. Leave a comment here or share a photo via social media and tag me (@eatingbirdfood) or use the hashtag #eatingbirdfood in the post. Seeing you try my recipes makes me all warm and fuzzy inside and it’s honestly what keeps me posting. That and your comments. I simply love connecting with you! Yummy, these look so tasty! Great for snacking or a little treat! these are so beautiful!!!! i love that they’re not too many ingredients – i’m all for easy-to-prep recipes!! i haven’t made coconut butter before, but i need to get on it. Yum! Those look so good and pretty easy too! These sound like the perfect little treat will definitely need to give a try. Thanks for sharing. I have to say, I got to taste test these and they are absolutely delicious!!! 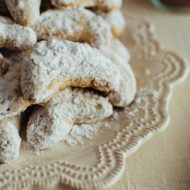 Can’t wait to make some this weekend. Mmmm these look so pretty and sound amazing! Hey Brittany! These look like such a GREAT snacking idea! Quick question that’s semi related, what style of vitamix do you have? Do you like it? Right now I have a Nutribullet for all my blending, but we’re planning to get a vitamix in the very near future so I’m interested in any insights you might have. Thanks! And I’m gonna add these to my ‘need to make’ list!